The beautiful "Villa Perl" is situated in a 12 hectare estate wonderfully set in Chianti region with wonderful view on to the Xth century castle and a panorama of typical Chianti rolling hills, vineyards, olive groves, cypresses and distant farmland. 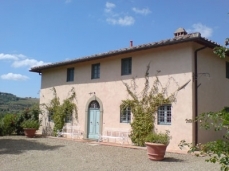 The villa is between Florence and Siena, half way between Montespertoli and San Casciano. The villa has an utmost privacy and has been immaculately restored to great standard in complete Tuscan style with terracotta floors, whitewashed walls and beamed ceilings. A 700 meter private road and a well maintained garden leads to the villa. From the villa is a path strolling down among the lawn and fruit trees leading to the private pool (12 x 6 m) for the exclusive use of the villa guests. Near the swimming pool, around the garden and terraces, there are abundant outdoor furniture, teak pool furniture, wrought iron and rattan settee, benches and chairs, marble tables and sun umbrellas for shade. The villa comprises of 2 floors the ground and the first floor. Ground Floor: This floor comprises of a living room fully furnished with antiques and fine custom linen. There is a study room, 2 twin bedrooms each having its own bathroom. The bedrooms are attractively furnished with four post beds and enjoy a beautiful view of the surrounding countryside and each of the bathrooms graciously decorated with old mirror frames and antique lamps. The dining room and the kitchen are adjoining. The kitchen is fully equipped (oven, washing and drying machine) with all the necessary utensils to prepare a meal. The kitchen opens on to a terrace overlooking the garden and pool, where a large loggia is furnished with table and chairs for outside dining and alfresco means. First Floor: comprises of 4 bedrooms with en-suit bathrooms. All of these bedrooms are air-conditioned, combining charm and tradition with comfort. The modern amenities in the villa include satellite television, phone, fax, HP computer, color printer and remote-controlled gate entrance. Villa Perl is an elegant estate, ideal for a large group or a family re-union or for an extended family for spacious accommodation, comfort, privacy and fabulous views.